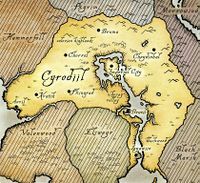 Like the diamond in the center of the Amulet of Kings, Cyrodiil is the heart of the Septim Empire and Tamriel. Still largely forested and almost landlocked, the beauty of the land has been sung of since time immemorial. Three Empires have wielded their power from the strategic center of the continent, so it is little wonder that Cyrodiil is widely know simply as The Imperial Province. The early Aldmeri settlers to Tamriel established strongholds on the islands of Summerset and along the coast, but did not venture far inland. Only oral histories and the fragmented ballad of Topal the Pilot offer glimpses of the ancient beast races that inhabited the land, but they are shadowy, mist-drawn portraits of time before reckoning. It is not until the coming of the Ayleid that Cyrodilic history truly begins. The Ayleids were ancient Aldmer, cousins of all the elven races that exist to this day. Over time, they became a distinct people, crafting a civilization whose ruins still puzzle and fascinate modern archeologists and adventurers. The ancient Nedic people, spreading south from Skyrim, became the slave labor for their ambitions, centered around the White Gold Tower. The slave rebellion of Alessia in the 242nd year of the First Era is a seminal event in the history of Cyrodiil, and all of Tamriel. While humans and elves had been battling in Skyrim for some time, and the Slave Queen's revolt could not be called the first victory of men over mer, it represents a turning point in the continental power structure. The heart of Tamriel was going to belong to these former slaves, present day Cyrodilics or Imperials, forever more. With the aid of the Nords of Skyrim, the Cyrodilics consolidated their power, forming a loose alliance between the two sometimes disparate regions: the rich Nibenay Valley, and the remote, rough Colovian Highlands. While the Alessian Empire continued to push westward towards the Direnni lands in High Rock, the greatest change was a cultural and religious one. The prophet Marukh's teachings both brought identity to Cyrodiil, codifying the pantheon most civilized Tamriellians worship to this day, and brought conflict due to the more severe strictures he espoused. The next great transformation of the land came from distinctly external forces. The foiled Akaviri invasion of 2703 brought about a new dynasty, and a new spirit of cooperation among independent nations, dedicated to fighting the common threat. Under the Emperor Reman I, Cyrodiil became truly cosmopolitan, incorporating aspects of High Rock, Colovia, Nibenay, and the sophisticated if strange culture of the defeated Akaviri into a common whole. The Cyrodilic Empire, also called the Second Empire, began again the process of expansion, founding a strong single nation, if not actually succeeding in conquering the entire continent. The assassination of Reman III and his son and heir Juilek at the end of the Four Score War with Morrowind marked the end of an era, if not the end of the Second Empire. Under the Akaviri Potentates, the system of governing continued to evolve throughout the Second Era, progress that abruptly ended with the assassination of the last Potentate in the year 2E 430. The rest of the Second Era was a time of great darkness and chaos throughout Tamriel, nowhere moreso than in Cyrodiil. Without a central government, Nibenay and Colovia split apart, farms fell fallow, villages were left in ruin, and the former Imperial highways became no man's land, the realm of bandit kings. The Imperial City itself became the prize for an endless series of would-be emperors, fought over for centuries until its glory was only a faded shadow of the great days when it ruled Tamriel. The rise of Tiber Septim has been amply documented in the history, and in a hundred books besides. In Cyrodiil, his influence could not be overemphasized. He gave the land back its traditional power and more, and became the symbol of it. He founded the dynasty that reigns to this very day. Cyrodiil, of course, helped Tiber Septim as much as he helped it. It gave legitimacy and a sense of history to his legend, which grew even ahead of his conquests. The Imperial City and Cyrodiil rose again in splendor, occasionally tarnished by the weakness of some of Septim's descendants, the War of the Red Diamond, and the Imperial Simulacrum, but never again did it lose its luster. The Imperial Province has continued to be the stable heart of the Empire, offering a model to its satellites of a government that settles disputes by diplomacy, not force of arms. The recent marriage of Lady Alessia, daughter of the Countess of Chorrol, to Count Marius Caro of Leyawiin typifies this, a perfect blend of love and sound political judgement. Nevertheless, there have been a few frightening moments in Cyrodiil in recent years. A suspected outbreak of the Knahaten Plague, a threat for the first time in hundreds of years, sparked panic along the southern border with Black Marsh. It was revealed to be a hoax, perhaps created by Argonians fighting back against Imperial excursions led by the Blackwood Company, and the fear was dissipated. Family strife in Kvatch claimed the lives of both sons of Count Haderus Goldwine, vying for the inheritance. While peace has been restored, the Count, at the time of this writing, is still in mourning, and has not designated a new heir. In the Imperial Court, there is thankfully no such tragedy. While the Emperor chose not to remarry following the Empress's death more than fifty years ago, she left to him three healthy boys, who have spent their adult years learning the art of politics from their masterful liege and father. Crown Prince Geldall has already taken many of Uriel's responsibilities, and has impressed one and all with his acumen. As the heart of the Empire is solid, all of Tamriel is strong.